It looks like comments by Pope Benedict XVI in 2006 about violence and Islam will be forgotten thanks to the efforts of Pope Francis. The Roman Catholic Church’s leader visited the United Arab Emirates (UAE), as part of the plan to encourage communication between Islam and Christianity. Pope Francis attended UAE’s Global Conference on Human Fraternity to mark the start of theological liberalism in 2019. 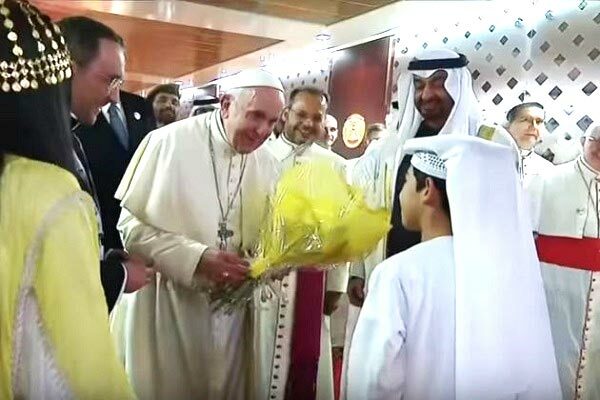 Sheikh Mohammed bin Zayed Al Nahyan greeted the pontiff after his arrival in the country. UAE is facing severe criticism from human rights groups due to their support for the war taking place in Yemen. Several organizations categorized this conflict as the worst humanitarian crisis to take place in the world. At the same time, UAE placed a blockade on Qatar, which affected its relationship with several Gulf countries. The whole reason why this inter-faith meeting took place is due to the efforts of the Grand Imam of Al-Azhar in Egypt, Sheikh Ahmed el-Tayeb. The leader wants to show the world the existence of a moderate brand when it comes to Islam. Before the Catholic leader embarked on his trip, he released a video, praising el-Tayeb for his efforts to bring both religions together. The pontiff wanted to make it clear to the world that God unites people, rather than dividing them. He added that God is gave both religions the opportunity to create history. When the pope visited Muslim-dominant countries as part of his tour, he prayed in several local mosques. For six years, the pontiff has been making efforts to bring together both religions by encouraging peace and tolerance. The meeting between the two figures attracted representatives from other faiths, such as Buddhism, Hinduism, and Judaism. The pope held mass for thousands in Abu Dhabi. The Asia News director, Father Bernardo Cervellera, stated that Christians now work in Gulf countries such as Oman, UAE, and Qatar. He said it was possible for Christianity and Islam to coexist, especially in modern Muslim societies. The Catholic University in Washington’s Sociology Department Chairman, Brandon Vaidyanathan, who was raised in Dubai, praised the Emirates for their efforts to promote religious tolerance in the country.